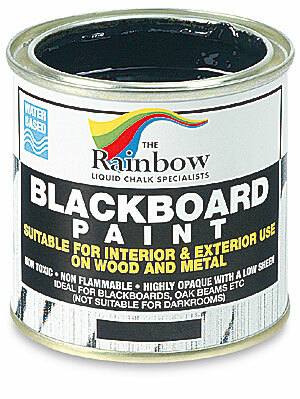 Converts wood, tile, sheet-rock, glass, metal, or any surface into a black board or gives new life to your old boards. Developed for liquid chalk markers, it also accepts stick chalk. 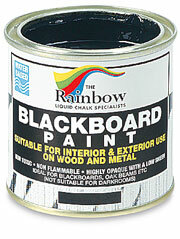 It dries without an abrasive finish for easy board clean-up. This also reduces the need for repainting. Highly opaque, low-sheen finish. Each 250 ml (8.5 oz) can covers approximately 32 square feet. Non-toxic, non-flammable. Conforms to ASTM D-4236.